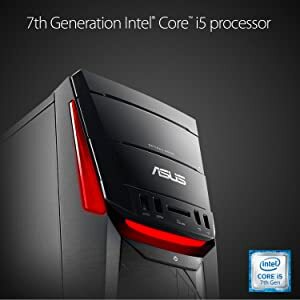 ASUS G11 is designed for gamers who want a high performance gaming platform that doesn’t break the bank. 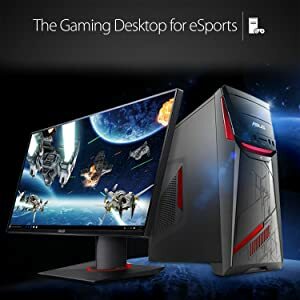 It has numerous LEDs spread across four areas of the chassis, including a centerpiece with customizable light effects that can showcase up to 8 million colors – so you can adjust the ambient lighting to suit the game you’re currently playing. 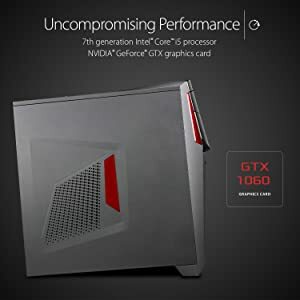 Inside, this cutting-edge chassis houses a 7th-generation Intel Core processor, and NVIDIA GeForce GTX 1060 graphics card for exceptional processing power and visual prowess. It also features DDR4 memory, and USB 3.1 for high speed data access. 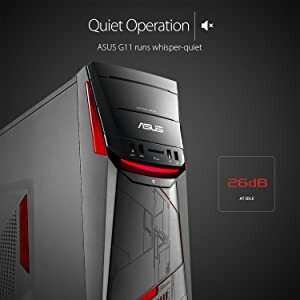 ASUS G11 runs whisper-quiet at just 26dB at idle – quieter than a library! It has been designed to keep noise levels down to a minimum, so you can leave this silent performer on all night to download files while you get a good night’s sleep. 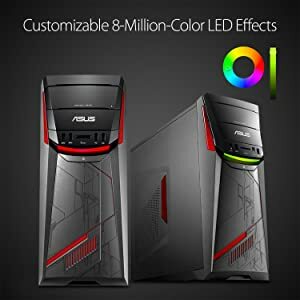 You’re immediately drawn to the three red ‘flames’ on the flanks of the ASUS G11, before your gaze moves on to the 8-million color customizable LED effects that dominates the center of the front chassis face. You can create ambient lighting to suit the game you’re currently playing; or you can use Pulse mode – with emits a soft pulsing glow that makes it seem that ASUS G11 is slowly getting ready for its next battle. The combination of the latest CPU and GPU means that your G11 is future-proofed with the latest technologies. Enjoy gameplay with up to 3x the performance over previous generations, plus innovative new technologies that enhance gaming experiences. 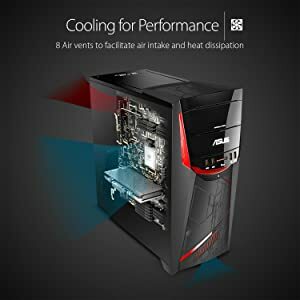 The ASUS G11 gaming desktop has been used by professional gamers in tournaments such as eSports Championship Series (ECS), the Overwatch Open, and Blizzcon. Top tournament organizes have chosen the G11 due to its powerful performance, reliability, and ease of swapping parts. 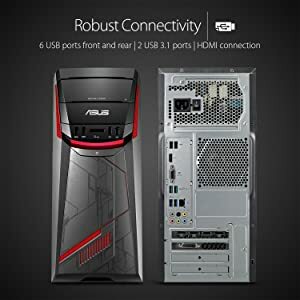 ASUS G11 has extensive connectivity options, including an HDMI port —so you can use your HDTV to game on an even larger scale. It also offers a total of six USB ports, including two USB 3.1 ports. Optional 802.11ac Wi-Fi ensures smooth and lag-free online gaming sessions, while Bluetooth 4.0 lets you pair G11 with mobile devices. In addition, you get 100GB of ASUS WebStorage free for an entire year!